(Child with dolls ) Charlotte was born 16 April 1917. She was named Charlotte after her aunt, who had committed suicide some years earlier. (CS’s house) The Salomon family lived in a large flat on the first floor of 14 Wielandstrasse, in an upper-middle class suburb of Berlin. The flat is now a Hotel, very close to the famous shopping street Kurfürstenstrasse. The Salomons considered themselves Germans first. They were Jews by religion but were not Orthodox Jews. As with other German Jews, they celebrated Christmas. When C was eight-years old, her mother, a sensitive, cultured and fragile young lady, committed suicide. The truth was concealed from Charlotte and she was told that her mother had died of influenza. (CS with father) I’ve never seen a photo of C with her mother, I’m not sure than one exists. Here she is with her father, Albert. It’s thought this photo was taken around 1928 when she was ten years old. Her mother must already have been dead. One senses that C is very happy and proud to be playing the role of her father’s lady. But Albert Salomon was a very conscientious surgeon and he spent a lot of time working and so he didn’t have much time with C. - certainly not as much as C might have liked. Thus she became rather resentful of what she called her “uninteresting” father. (CS with her governess:) C attended a Gymnasium/a grammar school for girls. But she also had governesses probably to fill in for the absent mother. C seems to have loathed most of her governesses – but you see her here with one that she liked a lot: C calls her “Hase”. (Paula) Life changed radically for C when in 1930, Albert married Paula Lindberg, a well known singer. Born Paula Levi, her father had been a Rabbi. Paula was a very ambitious gifted young woman. After first studying mathematics, she came to Berlin to take up music studies. She excelled and sang in concerts all over Europe under some famous conductors. Paula introduced her musical, artistic and learned friends into the Salomon family. They would have dinner parties and would arrange concerts and recitals. These friends included Albert Einstein, Erich Mendelsohn, Leo Baeck and Albert Schweitzer. So C was introduced at an early age into a very cultured life. At first C admired and adored her stepmother - but later she began to feel dominated by her, even suppressed and she seemed jealous of the rapt attention that everyone showered on Paula. (Military rally) In 1932 when National Socialists came to power, life had to change for the Salomons. Anti-Jewish feelings rose and severe restrictions were put on them. Paula was not allowed to sing in public, Albert had to move from the University to a Jewish Hospital and the atmosphere became intolerable for C at school. She decides to leave before taking the final exam and has private tuition, taking drawing lessons to prepare for Art College. (CS at 18) In 1935 she is accepted for the Art Academy. She is the only Jew in her class. Just a few Jewish students were allowed to study if their parents had been on the front in 1st World War. Albert had been a Doctor on the frontline so she was allowed to attend class. Her Professeur, Ludwig Bartning, was an active Anti-fascist and so kept a watchful eye on C.
(AW) At this time Alfred Wolfsohn was anxiously seeking a job to avoid being arrested. He was sent to Paula Lindberg who gave him a position as her singing coach and thus he was able to get work papers. AW lent Paula his manuscript, “Orpheus or the way to a mask” and discussed his theories with her. Following his traumatic 1st World War experiences, AW had suffered major psychological disturbances. His attempt to solve these traumas lead to the development of his ideas and the founding of his whole philosophy. For example, he recognised the limitations imposed by society on the voice and he perceived of the idea of the Unchained voice, a voice free to express the whole personality both male and female. (This seems incredible now when “all” is possible. So AW was very much a pioneer of this vocal release from gender and social restraints). In his search to understand his own soul, he said “we all have to descend into the depths of ourselves before we can ascend into the heights”. Thus he took the “Orpheus” legend as the forerunner/the title of his manuscript. C would have first met AW when he came to the family home to give Paula lessons. She was obviously very struck by him and there followed many meetings in and out of the Salomon house – discussions of art, music and philosophy. She must have read and fully understood his manuscript - as we will hear later. (AW) AW and C had a close friendship, how close we don’t know – but we do know that AW was certainly C’s first love, teacher and spiritual guide. On the otherhand, AW had no idea of the influence he had on C and he was only to learn this many years later. In fact he wrote that he had always found it difficult to get through to her “she was extraordinarily taciturn and quite unable to break through and emerge from the barrier that she had built around herself.” He felt compelled to attack this barrier but when he talked to her trying to break it down, she would gaze at him with such a challenging look that he was spurred on to greater activity, forcing him to play the clown. (Photo)To return to Berlin of the early ‘30s, the Kulturbund, a Jewish Cultural Association, had been created by Kurt Singer, a great musician and psychiatrist, and a friend and admirer of Paula’s. The Association arranged concerts for the Jewish Community and these were a great source of pleasure and togetherness for Jews all over Germany during those difficult years. Paula sang in many of these concerts. C love of music would have been fired by these events. But - the persecution and harassment of Jews was intensifying. C was greeted at the Academy with shouts of “Jews out!”. To cap it all, early in ‘38 C won a prize at the Art Academy but being Jewish she was not able to receive it, and so her arch-rival, the beautiful Barbara, received it instead. C must have been deeply hurt and never went to the Academy again. Many years later Barbara described C as always looking “like a grey November day”. C had probably always resented Barbara’s good looks and carefree life as an Aryan, so her blank face and unexpressive demeanour become understandable. They were her defence against deeper hurt. In November 1938, a German diplomat was killed in Paris. A Jew is accused of his murder. As a result, on 9th November, there are revenge attacks on Jewish property all over Germany. This was Kristalnacht: a horrendous night of violence and destruction, Jewish shops were smashed and Synagogues burnt out. (Photo) This is the synagogue in Fasanenstrasse, it’s now been rebuilt. Albert was sent to the internment camp Sachsenhausen – Paula uses all her influence to get him out. Early 1939 it is decided that C must leave Berlin and go and stay with her grandparents in the south of France. Ostensibly she was just visiting for a weekend – that was the permit she had. C took with her one small suitcase and a disc of Paula singing Carmen. Her family and friends were well aware that she would be seeking shelter for an indeterminate period. AW came to see her off at the station along with other members of the family. That was the last meeting ever between AW and C. From that moment, they had no further correspondence or news of each other. (Grandparents) Her grandparents on her mother’s side, Ludwig and Marianne Grunwald, had taken refuge in Villefranche sur Mer as early as 1933. CS loved Villefranche and adored the garden, the nature, the sea and the special light. (OM) They live in a small house in the grounds of a large villa, called L’Ermitage at the invitation of its owner, Mrs Ottilie Moore. Ottilie Moore was German of origin, Goebbels by name, and she had married a wealthy American officier from Westpoint. With her husband now dead, Ottilie Moore opened her house to many young refugees of several nationalities. She was a benevolent but misunderstood woman. But she got on well with C and encouraged her talent for painting. She arranged for her friends to buy works and so helped C to have financial independence. (Cs drawing of g'mama) All seems to be idyllic until War was declared on Germany in September 1939. C’s G’ma becomes depressed by the awful world situation and tries to commit suicide. Her first attempt fails. In a fit of hysteria, the grandfather tells C for the very first time of the suicide of her own mother. Of the suicide of her aunt, Charlotte. Of the families’ history of suicides, 6 in all on her grandmother’s side (4 women and two men). Despite all C efforts to help her, the grandmother finally succeeds in taking her own life by throwing herself out of a window. In the process, she nearly pulls CS with her. (Camp) In June 1940, France surrenders and all Germans living in France are interned. C and her grandfather are imprisoned in the Camp of Gurs, in the Pyrennees. Conditions are terrible there. However because of her grandfather’s age and frail health, they are released one month later, on the understanding that she will look after him. They return to Nice. Her grandmother’s suicide and her time served in the camp, have profoundly affected C and left her very disturbed. She consults a family friend and doctor, Georges Moridis. He advises CS to continue her painting. She takes his advice, and with the memory of her dear friend and teacher, AW, and with his words ringing in her head, she begins to paint her masterpiece “Life? or Theatre”. Between 1940 and 1942, she painted over 1300 gouaches. (Hotel) She continued to have problems with her grandfather who constantly complains and provokes her. So for several months, she abandons him and takes herself off to the Hotel Belle Aurore, St Jean Cap Ferrat. As Marta Pécher, the owner reported, “She painted all the time, always humming to herself. My husband and I asked ourselves when she eat and whether she ever slept”. When Jews were asked to report to the Town Hall, C, a good German girl, dutifully responds. Only the quick wittedness of a French gendarme telling to get off the bus and go home, saved her from being taken off to an internment camp there and then. In August 1942 she finishes her creation and gives it to Dr Moridis with the words “C’est toute ma vie” It’s all my life. In the mean time, Ottilie Moore had left for America taking with her all but four of the children. These she leaves in the safe keeping of C and Alexander Nagler, a Jewish refugee from Austria. (Photo of Alexander) C is reported to have said “She left behind only one friend and I had no idea how to deal with him.” At another moment, she says “I projected all I wanted onto him”. (Cs painting of him) Alexander was seemingly a weak character, a sponger and not particularly liked. However he became C’s confidant and friend and he is reported to have encouraged C’s in her painting. Alexander certainly did one great service for the world. He wrote “Property of Mrs Moore” in big red letters on labels which were tied to the packages of paintings. He certainly helped to save LT for all of us. Grandfather Grunwald always felt C merited someone more cultured than Alexander. So when the grandfather died, Alexander and CS were free to marry. While applying for a marriage licence, Alexander is told that as an Aryan, he cannot marry a Jewess. With this, he blurts out that he is really a Jew himself. He is therefore forced to leave his false identity card at the Police Station and on it is the address of the Ermitage. They are allowed to marry and for some weeks they go into hiding. But the charm of the garden draws them back to the Ermitage. They were fine for a while but then they must have been denounced. On 21st Sept at 19H a Gestapo truck draws up outside the Ermitage, Alexander and C are thrown in the back. Via Drancy, they are taken to Auchwitz arriving 12 October 1943. C, four months pregnant, is sent to the gas chamber within a few days. Alexander is put to forced labour, he dies of exhaustion on 1st January 1944. It is not until 1947 that Paula and Albert Salomon (who have miraculously survived the war in hiding in Holland) visit Villefranche and Ottilie Moore gives them the packets of paintings. Ottilie Moore seemingly wasn’t interested in “Life? or Theatre?” Although it was dedicated to her, she didn’t appear in it. 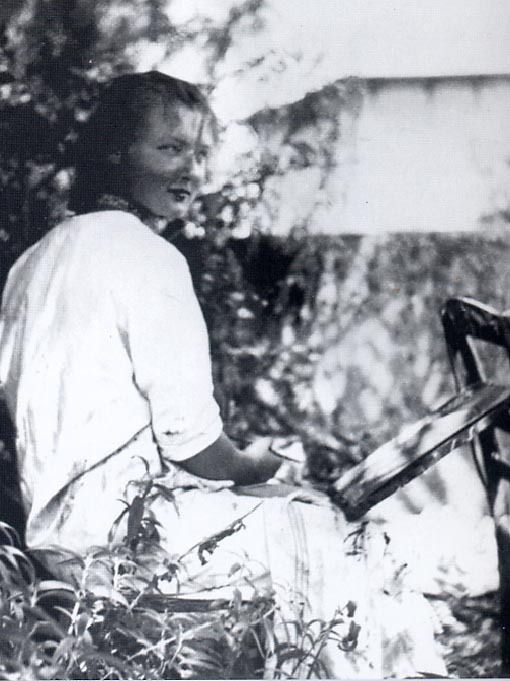 She preferred C’s other paintings, like this self portrait, or paintings of her garden, landscapes and the children. This rejection could well be seen as another fortunate move for us and for art history. Without Alexander’s packaging and Ottlie Moore’s indifference, Life? Or Theatre? might never have survived in tact. The first time Alfred Wolfsohn heard of CS work was in 1961 when he received this programme for the first exhibition of an edited version of Life? Or Theatre? In Amsterdam. He was completely devastated to see paintings of himself and her and to at last understand how much he had meant to her and how much he had misunderstood his own impression on her. Apparently he remained deep in thought for two days. The whole story of how “LorT” reached the public is a fascinating one – but that is for another day – now we must concentrate on the work itself. Of the 1370 gouaches, Charlotte chose 795 to make up her final version. In her introduction C says “the creation of the following paintings is to be imagined as follows: "A person is sitting beside the sea. He is painting. A tune suddenly enters his mind. As he starts to hum it, he notices that the tune exactly matches what he is trying to commit to paper. A text forms in his head and he starts to sing the tune with his own words” … then she describes how this could be developed : duets, then choruses. As far as we know C never had singing lessons with Alfred Wolfsohn. But obviously she was very influenced by the sung phrase, by the potential of her own voice. One could say from her description of her work process that she voiced her paintings and she did so with gut intensity. She created a theatre piece with a prologue, a main section and an epilogue. She orchestrated the scenes with music both classical: Schubert, Handel, Bizet and others…and with popular songs, anthems even prayers. Her wit and potential for theatrical innuendos are very present in these musical sketches. To begin with the paintings then - the Prologue: Here C sets the scene introducing most of the main and subsidiary characters. C was inspired by AW’s phrase “to come out of oneself, one first has to go into oneself, into ones childhood”. Here are few images from her early childhood. (4175 C with mother and angels) C’s mother used to tell her how lovely it must be in heaven and wouldn’t it be wonderful if she was turned into an angel with wings. C agreed it would be lovely only if her mother promised to send her letters which would be delivered by an angel on C’s windowsill. When her mother died this was the first deception in life that C encountered. No letters came from her mother via the angels. (4221) Paula Lindberg named Paulinka Bimbam arrives in the Salomon household and life literally lights up for the young C desperately in need of love and affection. (4245) Paulinka is a great support for Albert. But as she says here she cannot rid herself of the thoughts that one day young C might throw herself out of the window. These are C’s words put into Paula’s mouth of what she surmised Paula might be feeling at the time. Interestingly perceptive. Paula was a strong woman, very able to assert her will - but she was also very insightful - and compassionate with people in trouble. (4305) 1933 the Jews are persecuted. As C says “Once Jewish blood spurts from the knife, you’ll have by far a better life. Hunt the swine until he sweats and smash his window pains to bits”. (4335) Academy of Arts where it must have been a real joy for her to have been accepted: so her words full of great hope: “Only he who dares can win, Only he who dares can begin”. (4339) Life at the Art Academy is not so easy. Paulinka here says “Frankly I don’t understand how you can spend all that money. After all she has no talent for drawing…” Not a helpful comment for a sensitive artist in the make. Her father though was more encouraging and she was allowed to continue. (4353) Another glimpse of C’s humour: this painting is captioned “Ah now I’ve got it!” sung to the tune of the Marseillaise. C is becoming a talented life artist with growing expression and shrewd insights. (4356) But then there’s Barbara, “How beautiful our Barbara is” say all the students. And C suffers. She must have felt rejected because she didn’t find herself attractive. And as the only Jew in the class she was “different” in a bad way. She had to put up with many insults. It’s no wonder she had to put on a blank face-mask to protect herself. (4369) Here is Kurt Singer alias Dr Singsong at one of the Kulturbund’s concerts. He (or rather C) is commenting that Paulinka’s voice has lost its warm expressivity that it used to have in Prof. Klingklang’s day. And it’s on this painting that the Prologue finishes. If you like to read the rest of this lecture, that is to say the 'Main Section' and the 'Epilogue', then please write to Clara Silber. and her grandmother's fateful fall from the window - taken from Charlotte's own paintings.